Much of Australia's exotic flora and fauna cannot be found anywhere else in the world and the lifestyle is one second to none. Australia’s currency comprises coins of 5, 10, 20 and 50 cent; one and two dollar denominations and notes of 5, 10, 20, 50 and 100 dollar denominations. Banks are generally open from 9am-4pm Monday to Thursday and 9am-5pm on Fridays. In some states, selected banking facilities are available on a Saturday morning. Australia operates on 220V single-phase. Australian plugs have three pins and an adaptor is required for UK/European plugs and US plugs. Australia has three time zones. Eastern Standard Time (which applies to Queensland, New South Wales, Australian Capital Territory, Victoria and Tasmania) is equal to Coordinated Universal Time plus 10 hours (UTC +10). Central Standard Time (which applies to South Australia and the Northern Territory) is equal to Coordinated Universal Time plus 9 ½ hours (UTC +9 ½). Western Standard Time (which applies to Western Australia) is equal to Coordinated Universal Time plus 8 hours (UTC +8). Some food, plant material and animal products from overseas are not permitted in Australia. Some products may require treatment to make them safe and other items that pose pest and disease risks will be seized and destroyed by the Australian Quarantine and Inspection Service (AQIS). Some products may be allowed in if accompanied by an import permit (issued by AQIS prior to arrival), or after treatment in Australia to make them safe (fees and charges apply). Visit the Australian Quarantine and Inspection Service website for more information: www.daff.gov.au/aqis. All visitors should apply for a visa at least two months prior to their intended date of departure and four months prior for people with character of health concerns. Please see below the information for guidance on the visa options that may be most suitable for your event participants. NB these are the visa option available at the moment, but the Department reserves the right to change regulations. Note: for the purposes of attending the above event, the participants may wish to consider applying for one of the following visas, based on their role at the event. eVisitor visa, ETA or Visitor (subclass 600 visa in the business visitor stream - should be used by conference participants, unless they are being paid by an organiser in Australia for their participation or they are selling goods or services directly to the general public. Temporary Work (short stay activity) (Subclass 400) visa - should be used by those who are being paid by an organisation in Australia for their participation in a conference and those who are selling their goods or services directly to the general public. NB: IECN assistance will not guarantee a visa grant. Visa applicants must demonstrate that they meet all the legislative requirements for an Australian visa. Service Delivery Partners (SDPs) that operate Australian Visa Application Centres (AVACs) and Australian Biometric Collection Centres (ABCCs) are also located in various countries. These centres provide visa application lodgement or biometric collection services on behalf of the department. A map locator with details for each SDP is available at wwwimmi.gov.au/contacts/overseas/. Please note that visa applicants who lodge their applications through an Australian Visa Application Centre my need to pay a fee to use this service. This service fee is separate from the visa application charge. If you are calling Australia from overseas, firstly, dial the international calling code (0011), followed by the country code prefix (61) then the area code without the first zero (02 for Sydney would become 2), then dial the phone number. For mobile numbers, dial 61, ignore the zero, then the remainder of the phone number. gateway to its many attractions. Laze in the lush gardens of Southbank, then browse the markets and swim in its lagoon. Bike ride in the city Botanic Gardens and abseil the cliffs of Kangaroo point. Glide down the river on a majestic paddlesteamer or take a high-speed ferry to vibrant inner-city villages like Bulimba and New Farm. When culture cravings hit, wander the art galleries and museums, watch a performance by the Queensland Ballet, Opera or Orchestra or see cutting-edge theatre in the Powerhouse. In the boating hub of nearby Moreton Bay and Islands, you can swim, sea kayak, snorkel coral reefs, toboggan down the world’s tallest sand dune, hire a sail boat or tussle with a marlin. From the iconic Surfers Paradise beaches to the lush green Hinterland, there’s a new experience waiting for you at every turn on the Gold Coast. Theme parks and year-round sunshine are just a few of the reasons 10.5 million visitors flock to this vibrant city each year. The Sunshine Coast is a natural refreshing environment with pristine beaches, fresh water rivers and lakes, subtropical forests and warm sunshine. 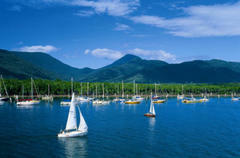 Cairns - a tropical climate, the magic of far north Queensland, the Great Barrier Reef and world heritage rainforest parklands, all make Cairns a unique choice for people who want to seek the most out of life and witness a unique environment. Sydney and its surrounds are home to some of the best food and wines, fashion, arts, culture and natural environment to be found anywhere in Australia. 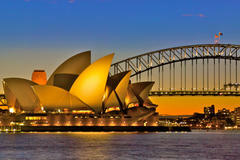 There are many things to see including the Sydney Opera House, Sydney Harbour Bridge, Bondi Beach and lots more. However long your stay, you're sure to find plenty to do in Australia's largest city, Sydney. If you have a passion for wine, then a visit to the Hunter Valley is a must. With more than 150 wineries, the Hunter Valley produces some terrific wines with a wide range of tours available. The Hunter Valley is located in the NSW region approximately two and a half hours north west of Sydney. in the bushland surrounding the city. 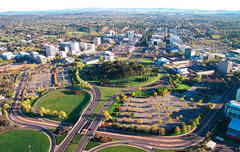 Whatever you want to do, you'll find it in abundance in Canberra. Melbourne is a young city offering vibrant energy, restaurants, fashion boutiques, unbeatable galleries, spacious parks and a fascinating mix of heritage architecture design. 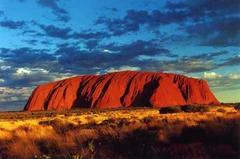 Ayers Rock/Uluru, the world's largest monolith and an aboriginal sacred site is Australia's most famous natural landmark. Visitors may wish to make the tough 1.6km ascent to the top or take a walking tour around the rock with an Aboriginal guide, learning about its fascinating history with the Uluru people and its importance in dreamtime legend. The Great Ocean Road is an Australian National Heritage listed 243 kilometre stretch along the south eastern coast of Australia between the Victorian cities of Torquay and Warrnambool. The Great Ocean Road is one of the world’s most scenic coastal drives and includes the 12 Apostles, iconic surf breaks and waterfalls.